In 1977 Voyager II was launched into space, inviting all lifeforms in the universe to visit our planet. Get ready. Company's coming. A gentle alien lands on Earth and assumes the human form of a Wisconsin woman's recently deceased husband. Eventually, he is assisted by the young woman in a desperate race against time and the FBI to rendezvous with his alien mothership in Arizona. The situation grows more complicated when the woman and the sweet-natured Starman begin to fall in love. After a career based around horror movies, director John Carpenter went down a different path with 1984’s Starman. The Voyager II spacecraft sends a message of peace to any potential non-terrestrials who hear it. One of them does, and he takes us up on our invitation. Unfortunately, we don’t greet his arrival very well. Armed forces shoot down the alien over Wisconsin, and he crash lands near the remote cabin of grieving widow Jenny Hauden (Karen Allen). She can’t get over her loss, so to help acclimate himself, the Starman adopts the form of her dead husband (Jeff Bridges). This leads to a curious story of romance and survival. Starman needs to get to an Arizona rendezvous in three days or he’ll die. Jenny agrees to take him there, but they don’t go without pursuit, as the US forces try to intercept them so they can capture Starman for scientific purposes. On the surface, Starman looks like a more adult take on ET the Extraterrestrial. Beneath the surface, Starman still looks that way, but that doesn’t mean it’s just a cheap knock-off of its hugely successful predecessor; Mac and Me this ain’t. Starman does echo some shots from ET, whether it meant to or not. For instance, one scene in which both Starman and Jenny scream seems awfully similar to a shot from ET. I suppose some redundancy becomes inevitable when two films take on such similar stories, though. It’s too bad this Blu-ray includes no supplements, as I’d love to know more about how Carpenter approached this area. Though it becomes impossible to view Starman without ET in mind, the Carpenter flick still offers its own charms. Some of those come from the film’s talented cast. Bridges earned an Oscar nomination for his work as the Starman, which may or may not be warranted. On one hand, he brings uncommon depth to what could have been an extremely one-dimensional performance. We see how Bridges develops Starman and shows his growth through the movie. On the other hand, Starman remains a fairly showy role that doesn’t demand a whole ton from an actor. Heck, ET pulled off good emotional growth too, and he was a puppet! I think Bridges does well in the part, but the character’s potential is too limited; the role doesn’t force an actor to deliver the kind of range a normal human would. Allen does fine as Jenny, and she gets the tougher role. Jenny acts as the viewer’s connection to Starman, so we need to buy into her pretty well. Allen delivers decent personality here, but she seems a little stiff. I get the feeling she wants to resist the urge to make Jenny overly emotional so she goes too far in the opposite direction. Still, I think Allen is generally fine in the part, and she connects well with Bridges. I must admit that try as I might, I find it tough to get past the film’s similarities to ET. Sure, the pair have many differences; I don’t remember any scene in which Elliott and ET get it on. Nonetheless, they remain awfully similar, and virtually all of the comparisons favor the Spielberg classic. Starman just seems a little dry and without the same spirit. I could live without some of Starman’s plot contrivances. Jenny and Starman seem to meet an awful lot of total strangers willing to commit crimes to help them. Also, the fact they end up in Las Vegas feels like it exists solely to give us a cute scene of Starman in a casino. Most of the story works fine, but these stretches of logic create problems. Viewed on its own merits, Starman provides acceptable entertainment. I simply think it lacks the enduring charm of ET, and it just never really catches fire. The movie gives us a reasonably interesting variant on the ET mold but it never quite prospers on its own. 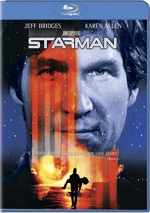 Starman appears in an aspect ratio of approximately 2.40:1 on this Blu-ray Disc. Flicks from the mid-1980s can provide very hit or miss visuals, but Starman offered excellent picture quality. Sharpness really excelled. From start to finish, the flick looked concise and detailed. Even the widest shots still demonstrated nice accuracy, as virtually no softness manifested itself. Jagged edges and shimmering were absent, and I also noticed no edge enhancement. Very few source flaws appeared. I saw a couple of minor specks but nothing remotely substantial. Starman went with a natural palette that looked great. The colors consistently seemed vivid and dynamic, as the film’s earthy hues came across well. Blacks were dark and tight, and low-light shots generally appeared solid. A few shadows were a little on the bland side, but not to a significant degree. Overall, the image barely showed its age; it really looked terrific. While not quite as timeless, the Dolby TrueHD 5.1 soundtrack of Starman also held up well. The soundfield opened things up well. In particular, a mix of action scenes added pizzazz to the package. Various vehicles traveled around the spectrum well, and the general environmental material also brought out a good sense of place. Most of the information blended together well, and the track was certainly more involving and active than what I expected from a 25-year-old flick. Audio quality was also fine, though a few elements were a little weak. In particular, louder effects like explosions and jets could be somewhat rough, but they still weren’t bad given the age of the recordings. In general, effects showed good clarity, and bass response could be quite nice. Music was pretty vivid, as the track replicated Jack Nitzche’s score well. Speech was always good. The lines seemed natural and lacked edginess or other concerns. Because some of the effects were a bit iffy, I didn’t think I could give this track an “A”-level grade, but I thought it proved very satisfying for its age. A few ads open the disc. We get clips for Water Horse: Legend of the Deep, Final Fantasy VII: Advent Children, Hachiko: A Dog’s Tale, Damages Season One, The Sky Crawlers, Blood: The Last Vampire, Ghostbusters, The Da Vinci Code and Casino Royale. No trailer for Starman appears here – or anything else, which stinks since bonus materials exist. 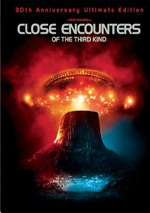 A Region 2 DVD has a John Carpenter commentary and other features; why not bring them to the US? Would we view Starman differently if ET never existed? I’m sure we would, but I’m not as sure that’d make it a more appealing movie. Starman delivers reasonable emotion and entertainment but it lacks the spark that would make it truly memorable. The Blu-ray offers excellent picture quality and very good audio but comes with no extras. The absence of supplements disappoints, but fans can rest assured that the movie has never looked or sounded better.